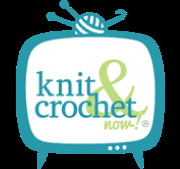 Our FREE email update is sent to you once every two weeks, bringing you crochet information, patterns, ideas, tips and the latest news. This easy-to-stitch ripple afghan is reversible from back to front and top to bottom. A versatile and super simple way to complete your summer look! Everything Crochet -- What Kind of Yarn Am I? A perfect table accessory for a night of entertaining. Give warm weather the cold shoulder with this simple yet alluring and sophisticated style. Craft your dream home with beautiful crocheted projects! 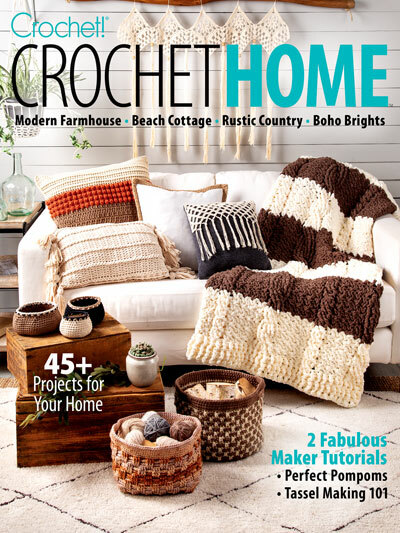 Whether your style is beach cottage, rustic country, modern farmhouse, boho or something in between, you'll love this special issue of Crochet! magazine, bursting with over 45 warm and welcoming crochet designs. Create a casual, beachy feel in your home as you revel in the relaxing coastal vibes inspired by the Cottage Life Throw. Alternating rows of ombré blues and white create the illusion of rippling waves for a calming, peaceful seaside feeling. Add a touch of farmhouse charm to any room with the rustic Sampler Pillow. Worked in super bulky cotton yarn featuring a variety of easy stitches, this pillow makes a big statement. Finishing touches of fringe and needle weaving complete the countryside look. Enliven your walls with crocheted works of art. Stitched in no time, the large, colorful Retro Mandala is crocheted using super bulky yarn over a large hoop! Display this fun piece indoors or outside--anywhere you want to pump up the drama. Stunning afghans and throws, pillows, baskets, kitchen items, rugs, table toppers and more round out this project-packed special issue! Get your copy and crochet your perfect home today!